Information: "Pug" was a term applied to many of the small non-descript shunting locomotives used across Britain and refers to their purposeful appearance. During the late 19th and early 20th centuries railways in Scotland did not have the traffic volume necessitating larger designs associated with British operations, as such Pug designs were quite prolific for both passenger and goods services. 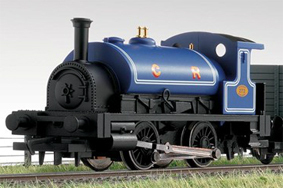 Details: Between 1895 and 1908 the Caledonian Railway built 14 of 0-4-0 saddle tanks to a Dugald Drummond design, under the direction of J.F. McIntosh at their St. Rollox Works in Glasgow. The basic two outside cylinder design was both easy to maintain and proved quite versatile in operation. Although provision for on-board coal storage was limited, it was not uncommon to see the Pugs attached to a coal wagon to facilitate longer run times. Locomotives could be called-on for suburban passenger services as required. Many of these locomotives survived both Grouping and Nationalisation of the railways, continuing their unglamorous work almost unnoticed. 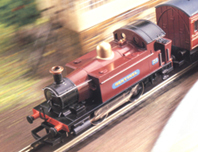 As the locomotives were made redundant by their owners, many found homes with Industrial Work sites until such time as they became life expired.